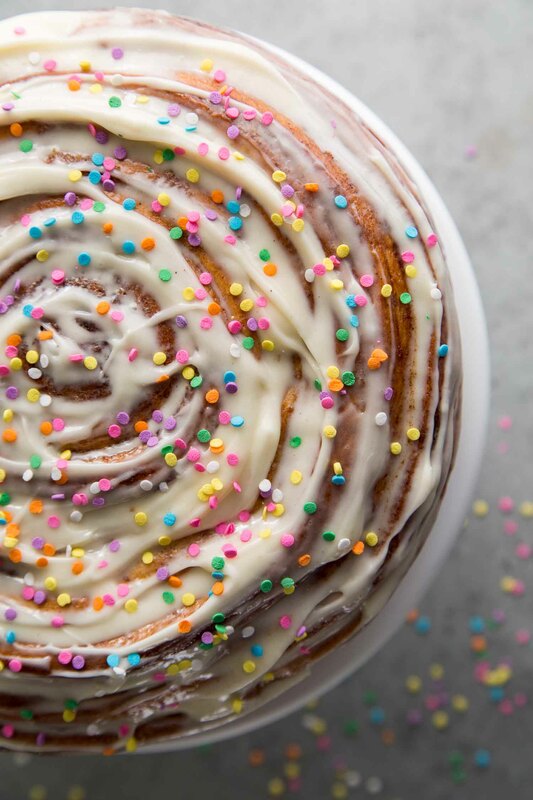 Instead of making a dozen standard sized cinnamon rolls, use the dough to make this 9-inch giant birthday cinnamon roll cake. This is what breakfast pastry dreams are made of! My dad would have turned 74 this year. I will continue to honor our birthday tradition and make him another variation of his favorite baked good: cinnamon rolls. From coconut jam cinnamon rolls to caramel walnut sticky buns, I’ll never tire of making his favorite treats. The sweet smell of birthday cinnamon rolls baking in the oven reminds of me all the good times, all the meals we’ve shared together, all the laughs, all the hugs, and all the goodbye kisses on my forehead. Birthdays should be fun and festive. It’s a moment to reflect on life and celebrate another journey around sun. Obviously, this day is best enjoyed with cake. Instead of the standard layer cake or sheet cake, let’s make something different. Does this count as cake? 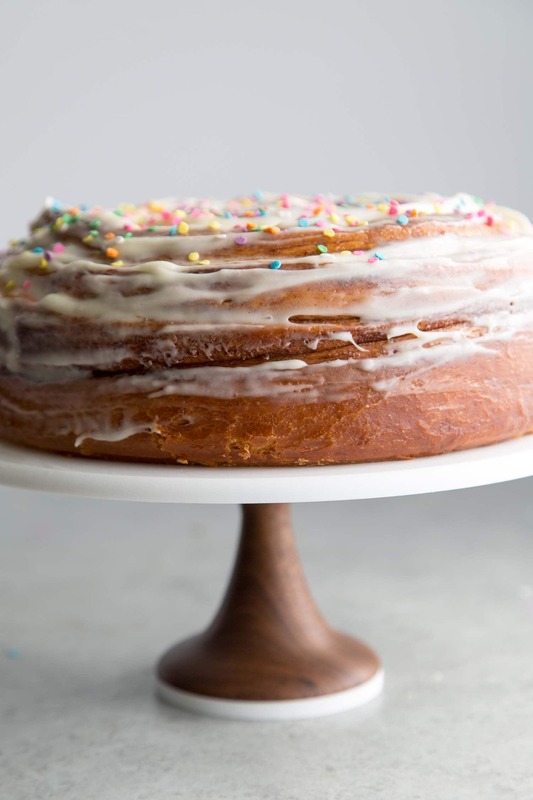 According to Merriam-Webster, the definition of a cake is “a sweet baked good made from a dough usually containing flour, sugar, eggs, and a raising agent.” Yes. 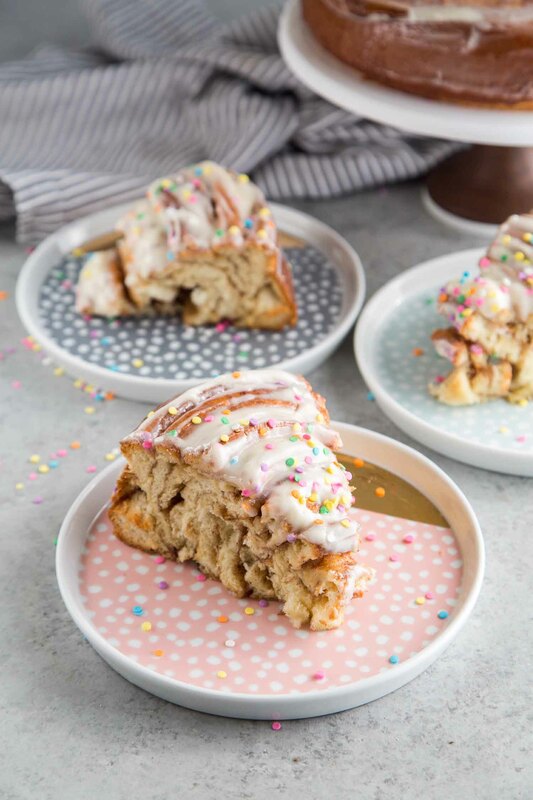 I’d say this cinnamon roll cake checks off all the boxes! You’re going to need a ruler, sharp knife (or pizza wheel cutter), and a 9-inch springform pan. These start off like any standard cinnamon rolls. 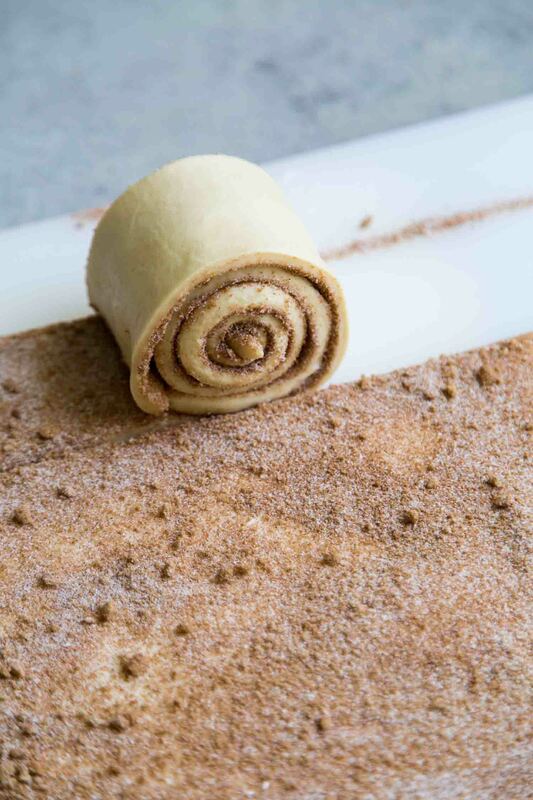 The yeast dough is rolled out to a rectangle, buttered, and topped with cinnamon sugar. However, instead of rolling the dough into a log and slicing it into 12 buns, the dough is cut into long strips. Using a ruler and sharp knife (or pizza cutter) evenly divide the dough into long horizontal strips. I measured mine at 6 centimeters, about 2 1/4- inch wide strips. Working from right to left, roll one strip into a snail like form (like a regular cinnamon roll). Align the tail end of the snail roll with the next horizontal strip and continue to roll into a larger snail. Repeat this with the remaining dough until you have a giant cinnamon roll like the one photographed below. 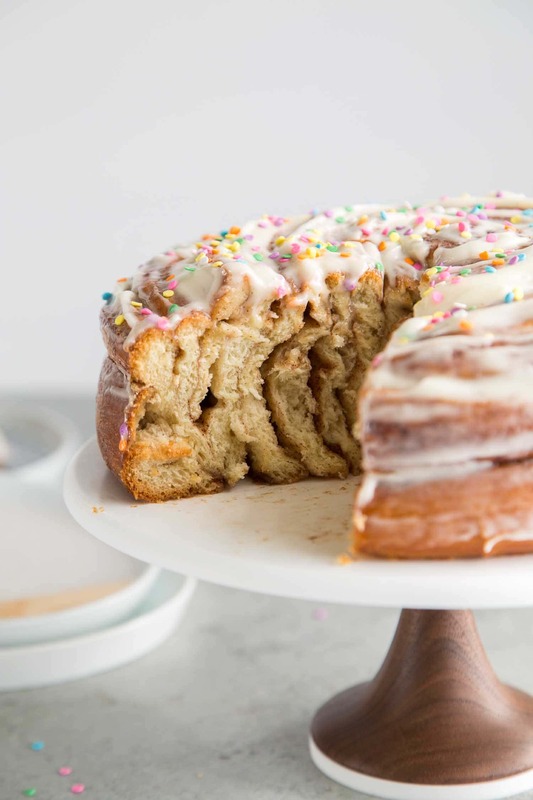 This giant cinnamon roll is best baked in a springform pan. It’s the same kind of pan used for baking cheesecakes. Springform pans allow for easy un-molding because the sides of the pan easily detach. However, one thing to note: be careful of leaks! If your pan is prone to leaks, I suggest either wrapping the bottom of the pan with foil or simply placing the springform pan on top of a baking sheet in the oven. 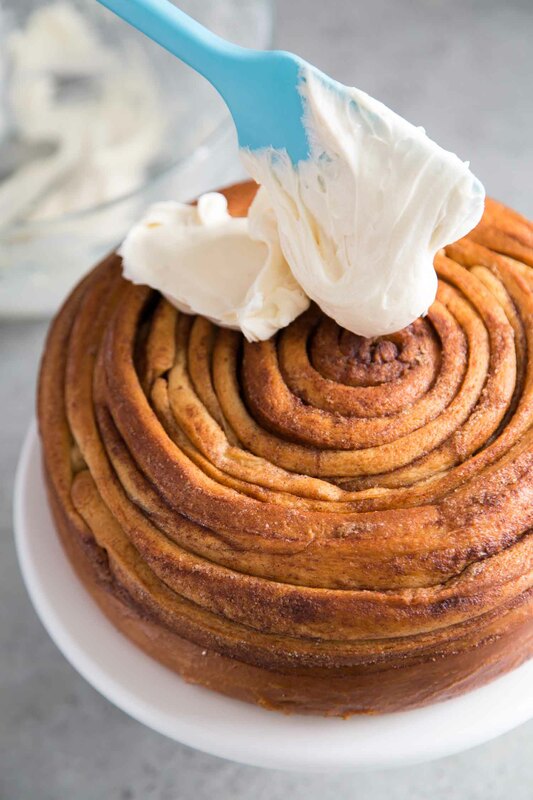 After baking, allow the cinnamon roll to cool slightly before adding the cream cheese frosting. Otherwise, the frosting will simply melt and turn into a glaze. 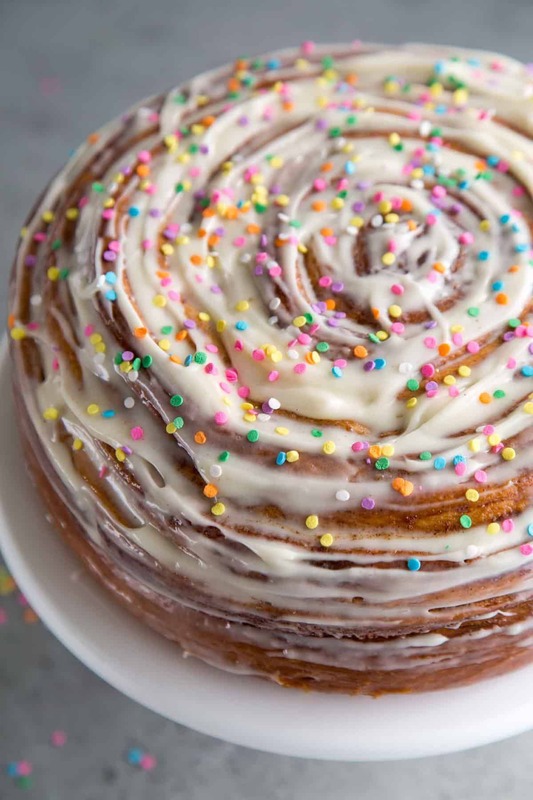 Because every birthday cake should have sprinkles, top the frosted birthday cinnamon roll cake with fun colorful confetti sprinkles! The cinnamon roll can be enjoyed warm or at room temperature. If you decided to slice into the cake warm, the bread may be a little gummy. I suggest using a serrated knife for slicing. As the bread cools to room temperature, it will regain it’s strength and structure, allowing for easy slicing. Dough: In the bowl of stand mixer, sprinkle yeast over warm water. Add 1 teaspoon sugar and stir to combine. Let sit for 5-7 minutes to allow mixture to bubble and activate. Add remaining 1/4 cup sugar, milk, egg, egg yolk, and salt. Whisk until eggs are thoroughly combined. Add 2 cups of flour to mixing bowl. Use the hook attachment to mix dough together. Mix on low speed until flour is incorporated. Add another cup of flour. Continue to knead on low speed, adding softened butter one tablespoon at a time. Add remaining cup of flour and knead until dough is smooth and no longer sticks to the sides of the bowl. If dough is too sticky, add additional one tablespoon of flour. Transfer dough to a large greased bowl. Cover with kitchen towel or plastic wrap and let dough rest at room temperature for about an hour until dough has doubled in volume. Punch down risen dough. Transfer to a lightly floured working surface. Roll dough into a 20x14-inch rectangle. Cinnamon Sugar Filling: Spread 1/3 cup softened butter over dough. In a small bowl, mix together sugar, brown sugar, cinnamon and pinch of salt. Sprinkle cinnamon sugar filling over dough. Using a ruler and sharp knife (or pizza wheel cuter) divide the dough into 2 1/4-inches x 20 inches horizontal strips. Working from right to left, roll one strip into a snail like form. Align the tail of the snail roll with the the beginning of the next horizontal strip. Continue to roll into a larger snail. Repeat this with the remaining dough strips until you have one giant cinnamon roll. 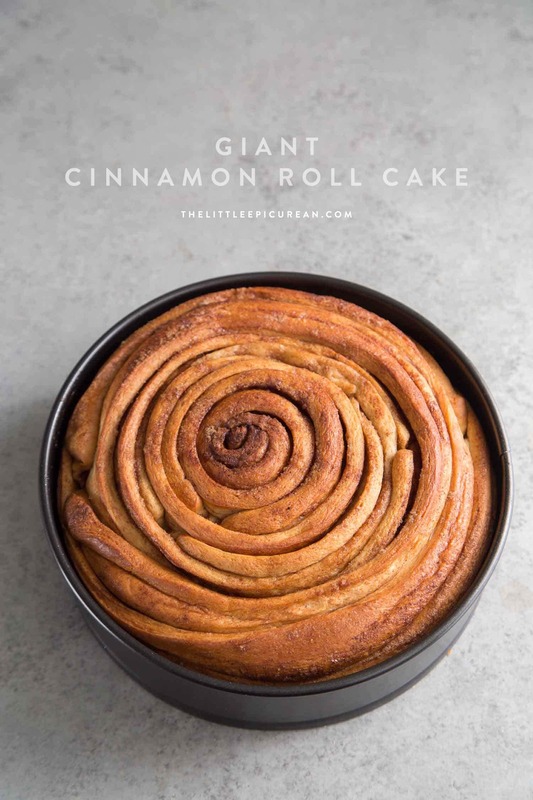 Place giant cinnamon roll into a 9-inch springform pan. Cover with plastic wrap or kitchen towel and let dough rest for 45 minutes at room temperature, until dough has expanded and risen. Preheat oven to 350 degrees F. Remove plastic wrap or kitchen towel. Bake cinnamon roll for 20 minutes, rotate pan, and bake for another 20 minutes. At this point the top of the cinnamon roll should be golden brown. Place foil on top fo the cinnamon roll to prevent it from burning. 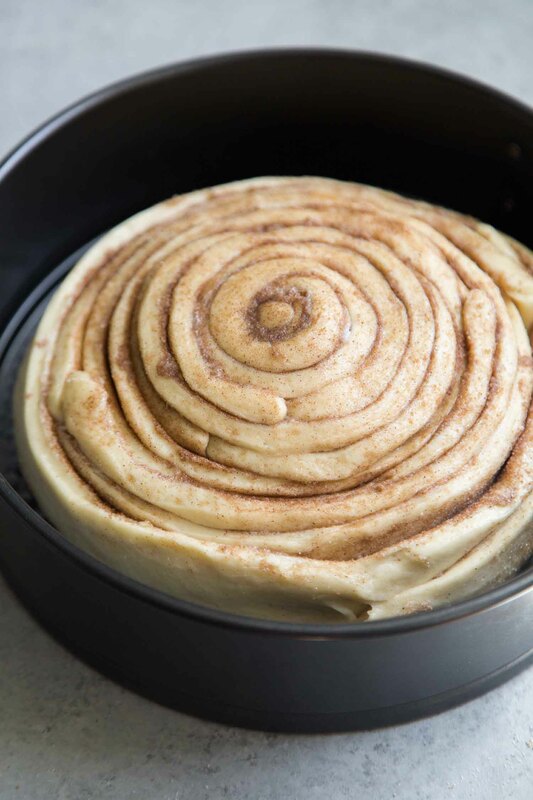 Bake for another 15-20 minutes until the internal temperature of the cinnamon roll registers at 185 degrees F. Allow cinnamon roll to rest in pan for 10 minutes before unmolding from springform pan. Cream Cheese Frosting: Beat together cream cheese and butter until smooth. Add powdered sugar, salt, and vanilla. Continue to beat until smooth and thickened. Scrape down bowl as needed to ensure thorough mixing. Spread over warm or room temperature cinnamon roll. Top with confetti sprinkles. This is so amazing! I think I would be fine eating this for breakfast, lunch, and dinner. And it would be quickly devoured in my house. Yum!! Made this for my husbands fiftieth birthday cake. I followed recipe exactly and it was delicious! Thanks for making it so easy to follow. Special occasion recipe, or just for baking therapy! I enjoyed making it. Happy belated birthday to your husband! Thank you so much for trying out the recipe. I’m so glad you enjoyed it! I would love to try your recepies. I would also love to share few recepies made by me. I love to bake. Have a good day.